When looking at the spec list of all the new bikes being rolled out, it’s not always obvious which ones have the highest quality parts fitted to them. With this guide to the groupsets, you’ll know exactly what you’re getting. It’s common to see the groupset name added to the bike model name when there are multiple variants of the bike. For example, the Bianchi Infinito range includes the Infinito Chorus (Campagnolo Chorus groupset) and the Infinito Ultegra (Shimano Ultegra groupset). There are also bikes which use a mix & match of parts from different groupsets, such the 2017 Specialized Rockhopper Comp, which mixes Shimano and SRAM. Campagnolo alone make nine different road bike groupsets, eight of which are 11 speed. Shimano have a grand total of 20 groupsets over their road & mountain bike ranges. SRAM make 17 groupsets in total, including two 12-speed mountain bike groupsets and a wireless-electronic road bike groupset... It’s no wonder groupsets are confusing! So where do all the different groupsets fit in? Between the three main manufacturers there are 22 different road bike specific groupsets. That’s a lot to choose from. The majority of road bikes available are generally outfitted with Shimano components, as the sheer popularity and availability of parts keeps the cost down. Groupsets from either Campagnolo or SRAM are typically only found on high end road bikes, alongside Shimano. It can be difficult to give an exact comparison of the individual groupsets between manufacturers, since personal preference, past experience, cost and other factors might give you preference for one over the other. 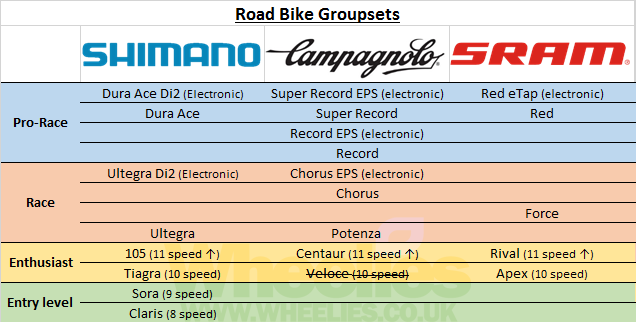 However in terms of component quality and performance, the table below shows how the major road groupsets stack up. Shimano and SRAM battle it out alone for superiority when it comes to MTB groupsets, since Campagnolo haven’t produced an MTB set since 1994. Within mountain biking there are various sub-disciplines which themselves have unique requirements from a groupset. For example, a Downhill bike doesn’t need to have a granny ring (small inner front chainring) for climbing, so single chainrings are better suited. There are strong brand loyalties for Shimano and SRAM components within MTB communities, so it can be difficult to find impartial advice on how groupsets from the two brands compare. 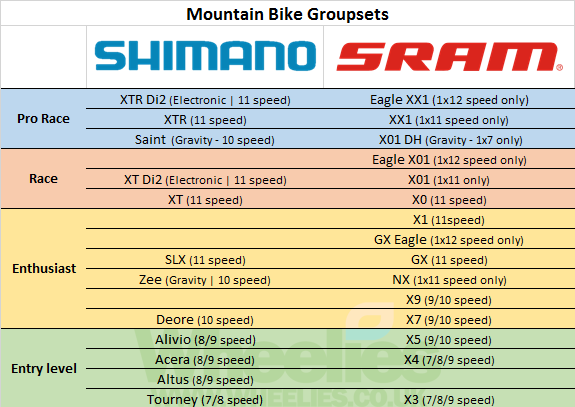 The table below is our team effort to create an impartial comparison of the MTB groupsets from both brands.